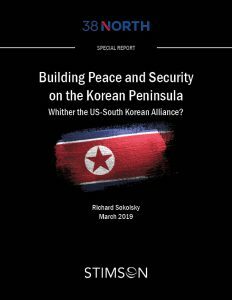 Building Peace and Security on the Korean Peninsula: Whither the US-South Korean Alliance? Further progress toward building a permanent peace and security regime for the Korean Peninsula will require, at least in the short-run, heavy lifting from North and South Korea if the Trump administration continues to thwart progress on a declaration officially ending the Korean War and other steps to lower tensions and build trust on the peninsula. If the two Koreas are successful in moving toward a peace treaty, or if the Trump administration decides to pull US troops out of South Korea, Washington and Seoul will need to take a hard look at adapting the US-South Korean alliance to changing geopolitical dynamics in the region. In the event that US troops leave South Korea, there are alternative security and military arrangements the two countries can and should adopt if North Korea ceases to be a military threat and enduring North-South reconciliation is achieved. These changes are feasible and affordable and would maintain stability and the balance of power in Northeast Asia. Before they are implemented, however, Washington and Seoul must first agree on the purpose of their alliance if it is no longer needed to deter aggression by a hostile North Korea. Reaching a consensus on this question will not be easy.